When I'm in the kitchen, I usually have music on and I'm listening and singing along. Inevitably someone in my family decides this is a good time to come and talk to me, by which I mean ask me a million questions and/or solve major problems. Which is fine, I'm usually pretty good at multitasking in the kitchen. This time, a third distraction vied for my attention while I was cooking. The doorbell rang and someone was on my door step taking a poll. Recently we've had a different person each evening at our door step selling magazines, books and a variety of other things. I really dislike people soliciting especially when a polite "no thank you" does nothing to move them away from my door or keep them from coming back. I really think this needs to be my next Pinterest project. I guess three distractions was just too much for my brain to handle. The cake came out of the oven looking perfect. Really beautifully golden brown around the edges. I couldn't even wait for it to cool. I went ahead and sliced into and it sliced beautifully. 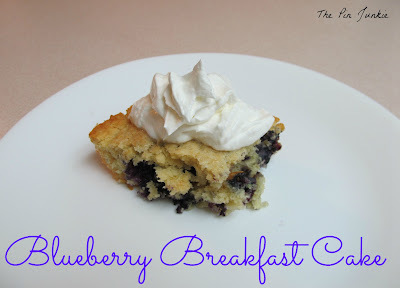 I put a perfect looking slice of blueberry breakfast cake on my plate and took a bite. The texture was perfect. Slightly crisp on the outside and soft and crumbly on the inside. It was really pretty good . . but it sure was salty! I took another bite and thought what a shame that this cake was so perfect in every other way, it just wasn't very sweet. I wondered if I'd put too much salt in, and then realized I hadn't put in any sugar. I went back and checked the recipe and sure enough I hadn't put the 3/4 cup of sugar in the darn cake! So it was a good recipe, I think. I think it will be a lot better when I make it again and put the sugar in it. Ooh this looks amazing! I'm drooling! ;) I found you at the Titus 2 Tuesday Link Party-- thanks for sharing! This looks great! 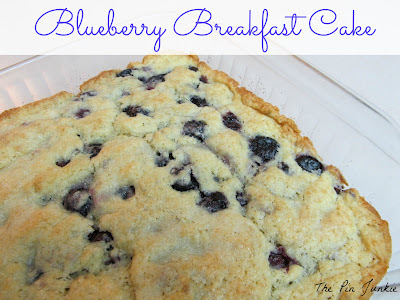 I love blueberry muffins so I am sure I would love this too! LOL...that sounds like something I would do. I had a friend who was entertaining an evangelist. She put a can of pumpkin in a pie crust and served it. I love blueberries and look forward to trying this. With sugar. 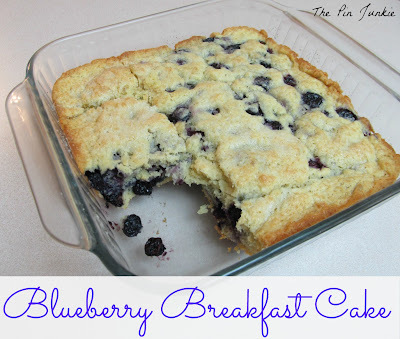 I love blueberries, and can never get enough recipes for them, always ready to try another one. This looks yummy! Following from the Blog Hop. Nice to know you via blogging. I'm now your latest blog, pinterest and twitter follower. Hope to hear from you soon. Oh.Em.Gee!! That looks amazing. It looks so fluffy & those blueberries look so full. Ha, i may or may not be drooling right now. I'm stopping by from the blog hop. I hope your having a great week. I would like to have a piece with my tea please. Hoping over from bloghop. I am new follower! nice to meet you! OMG, I am sitting here just laughing. Something similar happened to me, and I left out the baking powder. Needless to say, it didn't raise. The joys of cooking and the doorbell. The sign is the best. I've been looking for a new breakfast recepie! Thanks for sharing the idea. I found you today thru the Linky Party at Made In A Day, where I'm #26. I hope you get a chance to stop by my blog and leave a comment, too! This cake looks so delicious! I'm hosting a recipe link up party on my blog and would be thrilled if you decided to participate!!! It simply looks GREAT !! 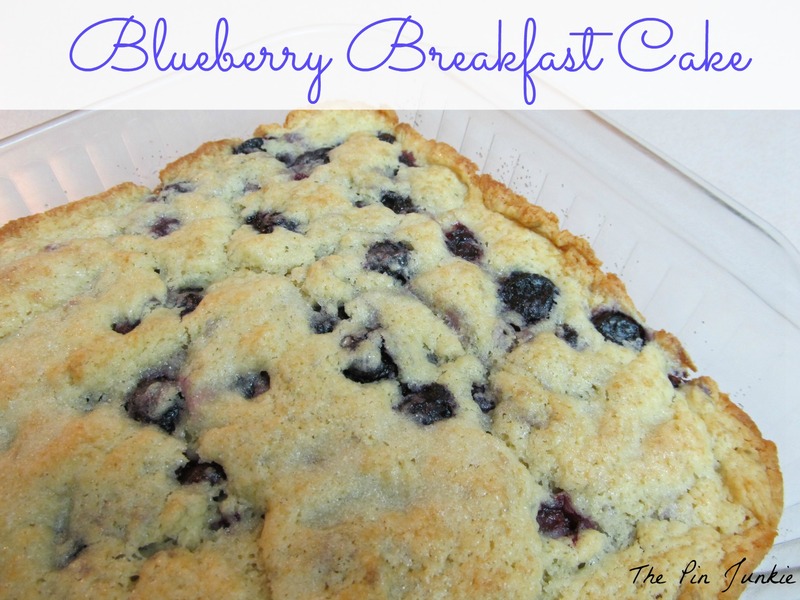 Thanks for linking up with #FTSF this week and sharing your cooking story! Sounds like it *almost* went perfectly. At least it looked great. Ha-ha! I do that too! Hello, Im visiting from the blog hop. Your blog is AWESOME! This blueberry breakfast cake looks delicious. I'm also your newest follower and fan. I can't wait to see what you have next. I hope you will visit my blog and want to follow back. This looks delicious. Thanks so much for sharing at Wednesday's Adorned From Above Blog Hop. Yummy looking recipe! And I have blueberries to use up. Thanks. Oops on the salt... so many distractions in life and I like my music in the kitchen too. Thanks for sharing your cake with us on foodie friday. LOL I've forgot the sugar in ice cream before. It was to bad as it had the condensed milk in it. The cake looks delicious and I love that sign! Thanks for linking up at Transformed Tuesday. Sounds like something I'd have done. lol Looks good though! I wonder how using strawberries as a replacement might work? Good job! It looks delicious. We need one of those no solicitation signs for our front porch. :) Thanks so much for sharing on Inspire Me Wednesday. This looks so good!! Thanks for linking up at Romance n a dime. Yes, please! Pinning this to my "Oh.my.yum" board! Thanks for linking up to my Show Off Your Shell Party!! Can't wait to see what you link up tomorrow! So funny, I just saw this on another one of my friends blogs and thought it looked delicious. I'll have to compare recipes. Thanks for sharing with SYC. I love blueberries and will give it a whirl. Oh, this looks so yummy! That's my kind of breakfast. Thank you so much for sharing at A Bouquet of Talent last week. So sorry I am just now visiting. Have a great weekend.